Receive news & special offers from Majestic Trailer & Hitch in your inbox! 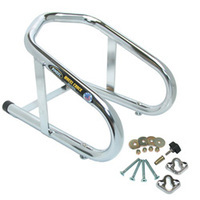 The Pingel Wheel Chock secures a motorcycle on your wood floor trailer. Pingel Wheel Chocks are designed with a unique T-bolt hold-down for quick and easy removal from the trailer floor, leaving only the near flush mounting brackets. If you use your vehicle for more than just motorcycle hauling, this is the product you need. The WC650 wheel chock is recommended for use with all tire sizes up to 6-½" wide. Made in the U.S.A.
All parts will be picked up at our Akron, Ohio location. CALL 1-800-691-9914 for Additional Options.